Guide: bulk chocolate beans prices. 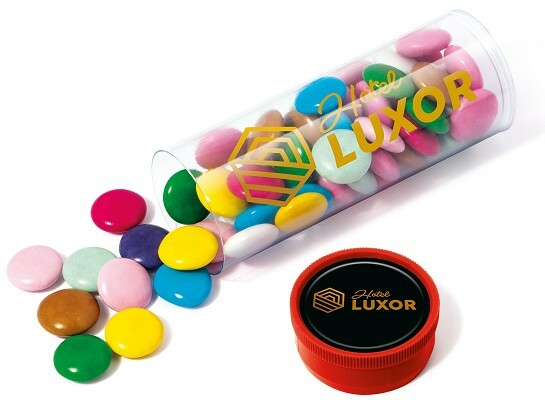 Our midi sized clear plastic tube is custom logo branded with a printed wrap and 29mm diameter lid. Filled with chocolate beanies. Other sweets we supply in a Midi Bucket are Speckled Chocolate Eggs and Retro Sweets. We use the finest Belgian milk, dark and white chocolates with various fillings and flavours. Our minimum order for these chocolate boxes is 100 and for small Neapolitans wrappers it's 500 pieces. We have many molds of international corporate companies, you can inquire for your specific logo or we can make a mould for your own custom design.